e-Book, PDF format, watermarked, 266 illustrations. 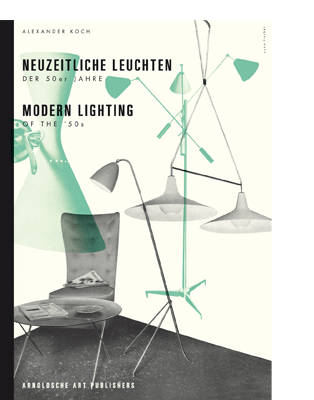 In 1953 the journalist and publisher Alexander Koch published his book ‘Neuzeitliche Leuchten’ (Lighting in the Modern Era). Nowadays Koch’s then selection of lighting by international designers and manufacturers seems truly visionary. the different countries of origin. It is very apparent that after the war America, Scandinavia and Italy exerted a strong influence on designs hitherto rather dominated by Bauhaus purism in Germany. An organic design concept, emancipated from the ideal of a machine and inspired by artists such as Alexander Calder, Henry Moore and Naum Gabo, along with new materials and manufacturing techniques, gave rise to designs with enormous innovative energy. the scenographic potential of the new lighting culture. More than 250 original images show the design trends of im portant manu- facturers from America, scandinavia, Germany and italy. Apart from numerous lesser known designs, one can also see lighting by prominent artists, designers and architects. this new edition of the almost obsolete original book is an indispensable standard work for collectors and modern lighting enthusiasts.